At room temperature the crystal gives off intense heat, earning it the nickname of "fire in ice," and making the estimated 700,000 trillion cubic feet of the substance scattered around the world a potentially major fuel source, containing more energy than all previously discovered oil and gas combined, according to researchers at the U.S. Geological Survey. Commercial production of methane hydrate is expected to take at least a decade—if it comes at all. Different technologies to harvest the gas are being tested, but so far no single approach has been perfected, and it remains prohibitively expensive. But booming energy demand in Asia, which is spurring gigantic projects to liquefy natural gas in Australia, Canada and Africa, is also giving momentum to efforts to mine the frozen clumps of methane hydrate mixed deep in seafloor sediment. The biggest concern is that the sediment that contains methane hydrate is inherently unstable, meaning a drilling accident could set off a landslide that sends massive amounts of methane—a potent greenhouse gas—bubbling up through the ocean and into the atmosphere. Oil and gas companies establishing deep-water drilling rigs normally look at avoiding methane-hydrate clusters. Nevertheless, the government of Japan—where natural gas costs are currently $16 per million British thermal units, four times the level in the U.S.—has vowed to bring methane hydrate into the mainstream by 2023 after a successful drilling test in March. In the government-sponsored test off of the southern coast of Japan's main island, Honshu, a drilling rig bored nearly 2,000 feet below the seafloor. Special equipment reduced the pressure around the methane hydrate crystals, dissolving them into gas and water, and then pumped about 4.2 million cubic feet of gas to the surface. While not a huge haul, it was enough to convince Japanese researchers that more natural gas could be harvested. If Japan can deliver on its vow to produce natural gas economically from the methane hydrate deposits off its shores, it could experience a natural-gas boom that matches the fracking-fueled one under way in North America, said Surya Rajan, analyst at IHS CERA. "If you look at what a dramatic shift the North American gas industry has gone through, could you afford to bet against something similar happening in methane hydrate?" Mr. Rajan said. In the U.S., scientists explored the northern Gulf of Mexico in May to map some of the 6.7 quadrillion cubic feet of methane-hydrate clusters believed to be underwater there. The most optimal places to harvest methane hydrate are near where the continental shelf transitions to the deep ocean, areas difficult to access from sea level. 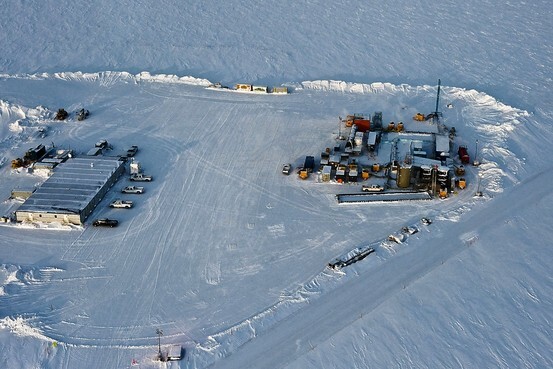 Last year, ConocoPhillips worked with the DOE on a test run producing natural gas from methane hydrate in Alaska's North Slope, home to about 85 trillion cubic feet of technically recoverable methane hydrate, according to DOE statistics. The company spent 13 days injecting carbon dioxide and nitrogen into methane-hydrate clusters in the permafrost. The chemical cocktail fractures the permafrost, allowing the gas to escape through the newly made fractures for collection. ConocoPhillips was able "to safely extract a steady flow of natural gas," a spokeswoman said.